The property was amazing! The hot tub was perfect, the beds were cozy and the views were amazing. The kitchen even had dish soap and there was laundry soap in the laundry room. It made more a perfect family get away. Beautiful cabin, amazing view and even better Hot Tub! Pool table was in great shape, plenty of room to play, and def the most fun item in the cabin! We like Great Smokys Cabin Rentals Great cabins, affordable price and friendly staff!! We came for a Birthday celebration. Loved the game room. We visited the casino. We had a wonderful time here for New Years! The cabin is perfect and we really enjoyed our time looking at the views. Hiking at Deep Creek was breathtaking and easy enough for our pregnant lady to enjoy. This was a perfect place for our family to meet. We came from Michigan, Ohio, South Carolina and Florida. We will definitely be returning, hopefully in the summer so we can tube. thank you for a wonderful vacation. 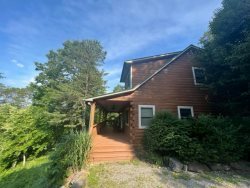 The Smoky Mountain High cabin was the perfect place of respite for our large family here in Bryson City. This was the first time taking our two young children on the GSMR Polar Express. it was magical! The cabin is clean, cozy and boasts an ideal set up for families. We enjoyed the breath taking views and vistas, warm fireplace and sweet Christmas tree. We are already planning a trip back. Thank you for assisting in making this a magical time of year. Something straight out of a Hallmark Holiday Movie! It was nice to receive a call after check in to see if everything was ok. This was our 4th year at this property. We always enjoy it. The views are wonderful, the covered decks protect from the direct sun and even allowed us to sit outside in the rain. The kitchen with 2 sinks and large island accommodates easy food prep for a large group. The cabin exceeded our expectations and beyond! It was beautiful, spacious and well stocked. Gorgeous view! The cabin is beautiful! Amazing view! Everything was great! We did plenty of hiking and waterfalls. Went to Cherokee and the Casino. Staff provided wxcellent communication. Plenty of knowledge before our arrival. We enjoyed our stay at your beautiful cabin. Wonderful trip. See you next year! The cabin was beyond our expectations, he stay was good, we enjoyed the hot tub and pool especially. Also got to see deer which was pretty nice. The cabin was Clean and organized. Staff was very nice and friendly. Cathy especially was readily available to answer questions that I had. We absolutely loved our stay at this cabin!! We really liked the hot tub and the view of the mountains. Was such a nice getaway for our family. Just didn't get any snow. This place nailed every checklist item I had for a mountain getaway weekend. Incredible view and excellent amenities to facilitate a total disconnection from the stressful daily grind. The cabin was very nice, we especially enjoyed the great space and the game room. The team at GSCR was very helpful. We were looking for the perfect place to have our wedding. The cabin was the perfect setting. The cabin was very welcoming. All of the features were great. We had many people coming and the cabin fit us all with room to spare and the views were great. The first time I spoke with Cathy and told her of our plans, she immediately began helping us with any questions we had. She was a large part of bringing our planning together. She has a great attitude and her willingness to help us was above and beyond what I expected. Amazing! Loved this house & the views! Already planning our next trip back! The people at GSCR are so friendly & willing to offer assistance through the entire process. We had a wonderful stay! The cabin was beautiful and provided a great home away from home on a fun snowy weekend. Everything you could possibly need was provided by the cabin. We were grateful to the staff for getting us to our cabin safely during a major snow storm. They were extremely helpful and responsive. Excellent lodging, service, and amenities. Excellent response time and feedback. We appreciated the Christmas decorations.